Zhou Youguang at his home in Beijing in 2012. Wikimedia Commons/Fong C. Some rights reserved. The architect of China's literacy revolution maintained an open-minded curiosity well into his second century. In the second week of January 2017, one of the greatest figures of modern times died peacefully in Beijing. He was 111 years old. His life had spanned the tumultuous period of modern Chinese history. Born in the fading years of the Qing dynasty, he was a teenager during the chaos of the republican era. In middle age, he saw the civil war that resulted in communist victory in 1949. Thereafter his life, like the life of all people from similar backgrounds in the new People’s Republic, was interwoven with subsequent experiences and movements – the campaign against the rightists in the 1950s, the apocalypse of the cultural revolution in the 1960s, and then the new world of reform and opening up delivered after 1978. Zhou Youguang’s experience contained so much of China’s modern history. In many ways he was the embodiment of the country’s messy but ultimately victorious struggle with modernity. And while the complex, fearsome face of Mao Zedong is the best-known public image of this struggle, inside and outside China, it is Zhou who will probably have the deeper and longer-lasting impact. This is a bold claim. But it is based on one phenomenal contribution. Zhou was central in the 1950s to the creation of the Pinyin transliteration system. To measure the scale of this achievement, the status of written Chinese at this time must be remembered. Its complexity restricted it to very few. Attempts at reform had been stymied by the fact that, in a country where most people’s livelihoods still involved backbreaking labour in fields and farms, the task of memorising 1,000-plus Chinese characters proved impossibly time-consuming. Anyone learning Chinese as a non-native speaker has to feel a sense of gratitude to Zhou akin to that of his compatriots. Until the 1950s the choice available was of Wade Giles or other approaches, which were clumsy and hard to handle. The former’s forbidding array of sound equivalents, when encountered today in older books, can still induce a headache. The alternatives were no better. Pinyin had an elegant simplicity. It caught on beyond any other system. Today it is almost universally accepted. And its impact was immense. Literacy in China now stands at 99% of the population. This sort of figure humbles the much lower success rates of other major developing economies like India. China is a country where the written word is accessible to almost everyone despite the complexity of the system. Zhou sits at the heart of this achievement, a contribution to the betterment of humanity which is unimpeachable and utterly positive. While Mao’s record will forever be sullied by the violence, bloodshed and suffering that his campaigns provoked, Zhou’s quieter victory will only ever be seen as an unalloyed good. 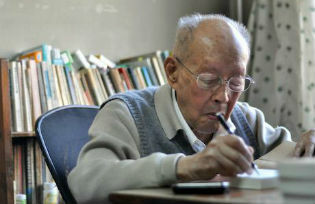 Deep into old age, Zhou maintained a powerful sense of curiosity and open-mindedness. In this, he represents the very best of the Chinese intellectual tradition – authentically, and profoundly, Chinese to its roots, but also outward looking, inquisitive and often mischievous and playful. In the cultural revolution he suffered in the same way as many as other intellectuals. In that era of perverted values, the fact that he had been based in Wall Street in the 1940s was enough to mark him as a public enemy. His formidable scholarly status would have done just as well. In any event he survived, and expressed no bitterness about what he endured. His dissent in later years was heroic. In face of it, the muscular and intolerant leadership that has developed under Xi Jinping could do little. Jailing a centennial would have been beyond even this government’s reach. Zhou’s sharp comments about the need for political reforms to accompany economic ones – kept up almost to the day he died – resounded in a period when almost all other voices had fallen silent. On his death, the current Chinese leadership issued a polite acknowledgment of his contribution. It is unlikely to be in attendance at his funeral. For those searching for the imprint of this man, a quick Google search shows footage of him, well into his 100s, being shown an iPad and immediately working out ways in which it could be useful and played with. He ran a widely followed blog on Weibo, calling himself the “centennial blogger”. After the death in 2016 of the great female writer Yang Jiang, the tangible and living links with the China of an earlier age are now almost wholly sundered. But every time a young Chinese, or a western university student, starts the lifelong task of learning Chinese, with all its wonderful richness and complexity, through the alphabetical symbols of Pinyin, they will be beneficiaries of this extraordinary, wonderful man. Mao in one of his most famous poems complained, almost certainly with himself in mind, that the current era was one with few heroes. He was right about that, but wrong about who they were. Above all, Zhou Youguang was the real hero – a man who quietly, effectively, and courageously made it his life’s mission to enlighten, aid, and share with others. Kerry Brown is professor of Chinese studies and director of the Lau China Institute at King’s College, London, associate fellow at Chatham House, and lead member of the Europe China Research and Advice Network. He was formerly director of the China Studies Centre at the University of Sydney. His latest book is China’s CEO: The Rise of Xi Jinping (IB Tauris, 2016).